Millburn High School Auditorium (doors open at 7:00PM). Walk the red carpet to see the amazing films made by Millburn Middle and High School Students! If you are interested in subscription busing beginning in September, the fee for the 2019/2020 school year will be $775.00 per student and is non- refundable. There is a family cap of $1550.00. Online Registration: All applications must be submitted online through CommunityPass. If you are interested in having transportation provided on a fee basis, please follow the directions found on our webpage to submit your application online by the deadline of Friday, May 31, 2019, by paying in total ($775) through your CommunityPass account via credit card or by dropping a check off to the Millburn Education Center. 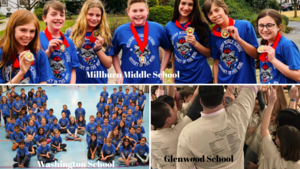 Life is Better as a Millburn Grad! Many Cultures – One Community -- Presented by the World Languages Department of Millburn High School. Student performances will reflect the rich diversity of our community and our World Languages program. 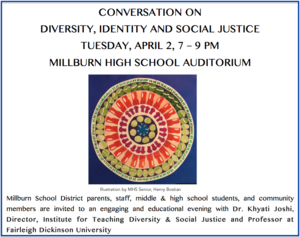 Dr. Khyati Joshi, Director, Institute for Teaching Diversity & Social Justice and Professor at Fairleigh Dickinson University will share her work with staff, and suggest solutions to promote social justice and inclusiveness and foster a community of tolerance and acceptance.